Since 2012 the Sonoma State Women's Soccer program has produced five All-Americans, three of whom have recently gone on to continue their playing careers as professional footballers. Twin sisters Cara and Lauren Curtin, who came up through the Sonoma County club soccer system were set on competing as runners at Santa Rosa Junior College when Emiria Salzmann Dunn recruited the pair to play for the Bear Cubs during her stint as the junior college's soccer coach before taking over Sonoma State's head coaching position in 2011. "They were very quiet, unassuming people and I had heard how talented they were as runners," said Salzmann Dunn. "I knew that they had great touch, agility, and body control, but I didn't realize at that time that it would translate into soccer players. Beautiful, dynamic, soccer players." The pair played alongside future All-American Carolyn Greco in 2013, helping Sonoma State advance into the first round of the NCAA Division II National Tournament. "It was a coach's dream," recalled Salzmann Dunn. "You had three of the most phenomenal athletes to ever play here straight down the spine of the field. A target striker, a center midfielder and a center back all down the middle." After a year-long hiatus during the 2014-15 season, Greco returned to the pitch the following year to complete her Sonoma State career with an All-American performance. The Seawolves went on to clinch the title of 2015 California Collegiate Athletic Association (CCAA) Regular Season Champions with a 10-0-2 line, marking the first time since 1998 Sonoma State had secured an undefeated record in conference play. Reminiscing about Greco's return puts an incredulous grin on Salzmann-Dunn's face. "It was like the soccer gods came and deposited the perfect player back on your team. She was fully emotionally developed, she was fully physically developed and she was playing for higher purposes. It was basically about coaching the finer points of the game. She really had it all." Following Cara and Lauren's tenure at Sonoma State, the Curtins sought out ways to extend their career past Division II competition. At the encouragement of their Seawolf coach, the pair found an opportunity to play professionally in Switzerland, and after a conversation with the president FF Lugano 1976, the twins headed to Europe in 2016 for a month-long tryout with the club. "Good thing we packed our bags," laughed Lauren. Following their first season with the Swiss club, the Curtins returned home and reconnected with Greco during a Sonoma State Soccer Alumni weekend, persuading their former teammate to try out for Lugano and join the two of them in Switzerland. Despite being recruited as a defender, Greco ironically found herself slotted alongside Lauren, playing a brand-new position in the Lugano midfield. However, regardless of her new positioning, Carolyn, Cara and Lauren each hit their stride and helped lead the club all the way through to the Women's Swiss Cup Final this past season. The Swiss Cup championship match proved an electric game, remaining scoreless through regulation before being decided in double overtime. FC Zürich Frauen, the winningest club in league history, eventually notched the game-winner in the 108th minute of the match. "Every team is hard," notes Cara. "It's really difficult. There are no easy teams." However, that's what has made their experience so rewarding. In a league filled with "tall and strong" national team players, the former Seawolves have found themselves right at home, making critical tackles and winning headers against the best players Switzerland's top league has to offer. Cara's 17 goals in 2017 ranked amongst Nationalliga A leaders, while the alumnae tore through Swiss Cup play undefeated until the final match of the tournament, one win shy of a UEFA Women's Champions League berth. The three attest that the experience of reuniting with former teammates has been incredible. Having a support group while acclimating to a foreign place and learning a new language has made the transition so much easier. From pushing each other on the pitch and developing their Italian together, to enjoying the region's pizza and traveling through Europe, the teammates have crafted their own "little bubble of family" based in the beautiful canton of Ticino. One of the more challenging aspects of the Lugano playing experience has been the local lack of understanding that professional women's soccer teams exist in the region. The teammates have found, in Italy-and thus the Italian region of Switzerland in which they reside-soccer is still predominately considered to be a man's sport, much like American football is in the United States. "It's a real foreign concept," explains Greco, "that these women from California are here to play soccer." Yet, after seeing a spike in interest during the late stages of Swiss Cup, the three believe that region's recognition of women's soccer is trending in the right direction. During the club's championship run, the Curtins and Greco began to notice an influx of TV reporters at practices and would even run into local fans on the street who would start chanting in support of the club. Greco's favorite moment of the season came after the conclusion of the Swiss Cup Final when she looked up in the stands at the club's supporters. "We had never seen girls' soccer [in Lugano]-like young girls playing-and at the end of the game, we saw all of these girls holding up Lugano banners, saying 'Go Lugano' and other things in Italian. I bawled. Those little girls, that was it for me." For the twins, just having the opportunity to play at a professional level in Europe has been the most rewarding part of their journey. 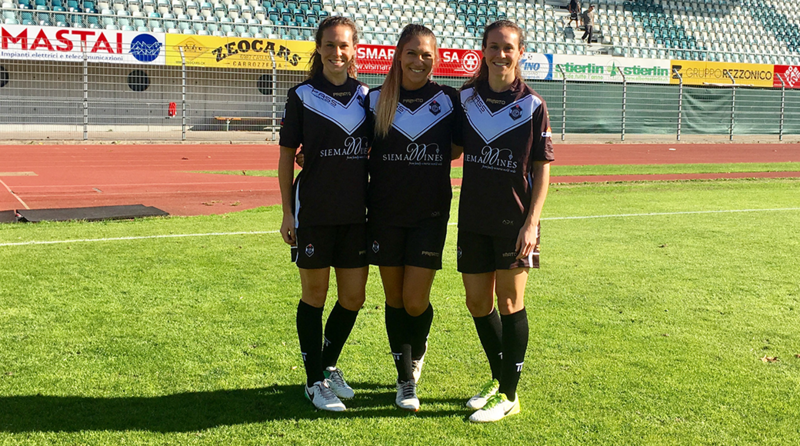 While Cara, Lauren and Carolyn are kicking off the start of another season with FF Lugano 1976 this fall, the three are keeping their options open for the future. Whether it's with other squads in Nationalliga A, a women's side attached to a predominant club such as Juventus or AC Milan, or even the Swiss National Team, each of the Seawolf alumnae have their eyes set on continuing their playing careers in Europe for the foreseeable future.